On 19 September 2016, an Aruba Airlines Airbus A320-200, registration P4-AAA, flight AG820, from Miami International Airport (MIA), Florida, USA, to Oranjestad-Queen Beatrix International Airport (AUA), Aruba, powered by two International Aero Engines (IAE) V2527 turbofan engines experienced a separation of the outboard fan cowl from the right-hand engine during takeoff. The flight crew was unaware of any anomalies until a passenger alerted the cabin crew of what he saw and the cabin crew relayed the message to the flight crew. The flight crew leveled off at FL220 to assess the damage to the airplane. 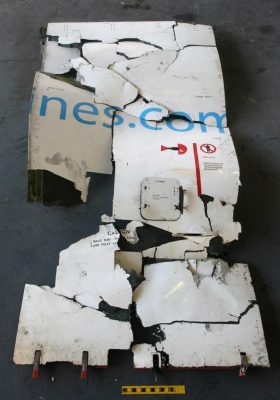 The crew was not sure if the panel had detached completely or was not visible from inside the airplane. All systems appeared normal in the cockpit but as a precaution, the crew elected to return to Miami. The flight had an uneventful landing on runway 09 at Miami Airport about 40 minutes after departure. Because the gate area where the maintenance was being performed was dark, the mechanic who completed the work used a flashlight to verify the latches were flush and made sure he heard a click. A second mechanic who was assisting, also verified that the latches were flush but did not use a flashlight; he stated in a post-incident interview that he could see they were flush. The task was then signed off in the logbook as complete but did not specify that the cowls had been opened and closed. The morning of the incident, about 04:30, the supervisor in charge of maintenance for Aruba Airlines performed a walkaround (although not required) using a flashlight and did not notice anything unusual about the cowl. According to the Aruba Airlines A318/A319/A320/A321 Flight Crew Operating Manual, section “Procedures – Normal – Standard Operating Procedures – Exterior Walkaround,” the fan cowl doors were to be checked that they were “closed/latched.” The first officer conducted an exterior walkaround prior to departure and did not notice any abnormalities. He stated that to check the cowl he bent down and checked that it was flush and latched. The National Transportation Safety Board in their report determined the probable cause(s) of this incident to be: the incorrect latching of the #2 Engine Fan Cowl following a routine maintenance check that resulted in separation of the cowl during takeoff. This incident is one in over 40 fan cowl loss events involving Airbus A320-family aircraft since 1992. Despite several airworthiness actions over time, incidents involving improperly closed cowl doors going undetected keep recurring. 20 January 2000; A320 of Airtours International at London-Gatwick, U.K.